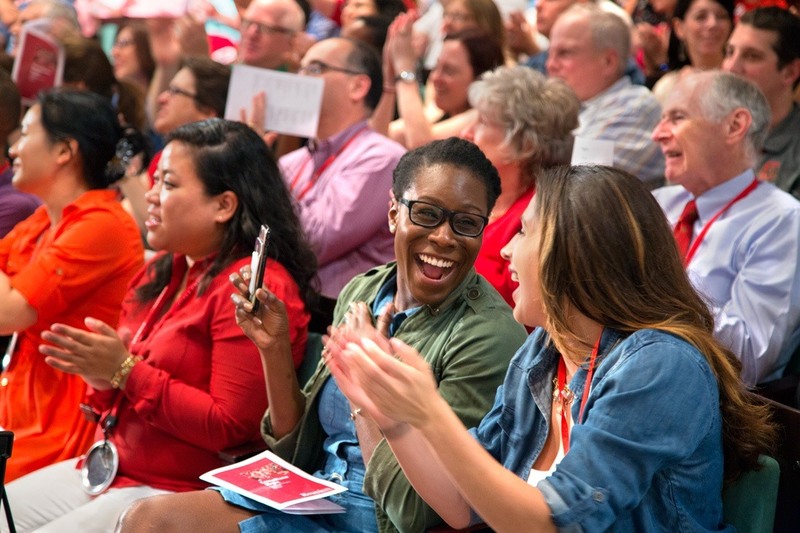 On September 21-22, more than 12,000 alumni, parents, faculty, staff, students, and community members enjoyed Homecoming traditions, including the Big Red Fan Festival and the football game against Yale. 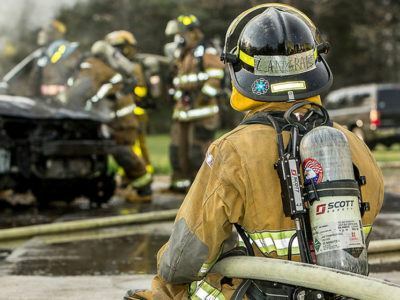 The weekend offered more than 150 events—from brunches and exhibits to tours and tailgates offered by colleges, units and campus organizations. 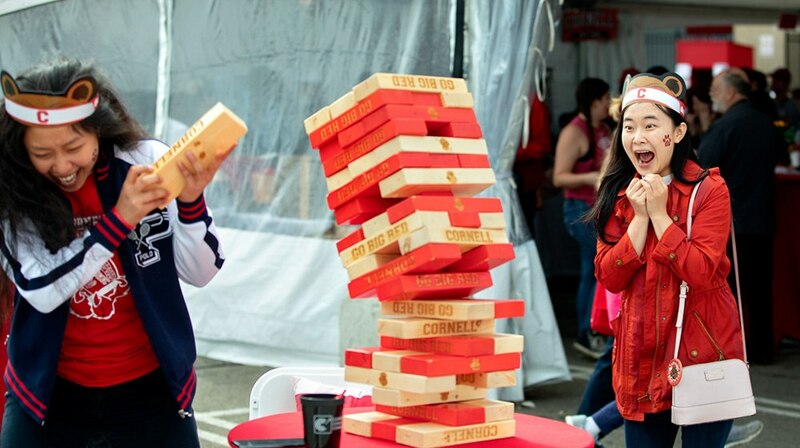 A cool fall day and party sunny sky create the perfect backdrop for Big Red Fan Festival fun. The Friday evening fireworks and laser light show was canceled due to National Weather Service forecasts of a severe storm, a difficult decision made for the safety of the anticipated 18,000 guests, said Bushlow. Although it poured rain on Friday, Saturday dawned clear. There was an early fall chill in the morning air as 144 runners made their way through F.R. Newman Arboretum in the Homecoming 5K, kicking off a full day of events, programs, and gatherings. 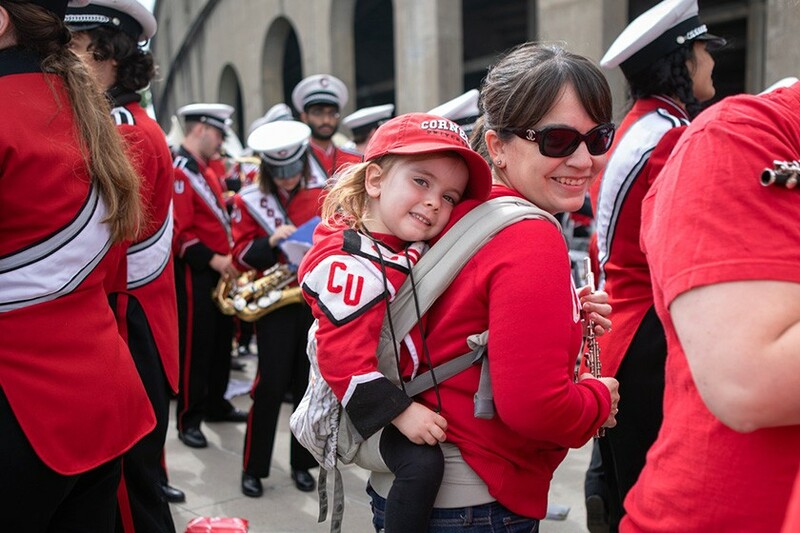 The sights and sounds of Cornell history enhanced Homecoming weekend this year. A reunion of chimesmasters celebrated the 150th anniversary year of the Cornell Chimes, and the Cornell Glee Club, the university’s oldest student organization, kicked off a year honoring its sesquicentennial. 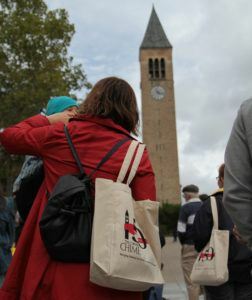 Spectators celebrate the Cornell Chimes sesquicentennial, listening to a concert of traditional favorites and new tunes. By 11 a.m. on Saturday, the sun was high and a crowd on Ho Plaza gazed up at McGraw Tower, home of the Cornell Chimes, for a musical trip through Cornell history. A video feed showed student chimesmasters in the tower playing a mix of new tunes and historical favorites. In another nod to university history, alumni of the Cornell Delta Phi Association commemorated the 100 years since Cornellians served in World War I with a ceremony at the Morgan Smiley Baldwin Staircase. Connecting Cornell Avenue with University Avenue, this campus landmark is named for an alumnus, Class of 1915, who died in 1918 fighting in France. 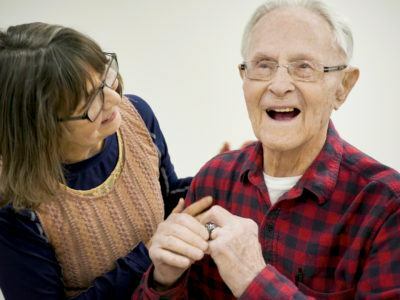 “We want to confirm the importance of this alumnus and the others who gave their lives in World War I to Cornell students, many of whom pass through here on their way to Cornell,” said Derek Edinger ’94, MEng ’95. 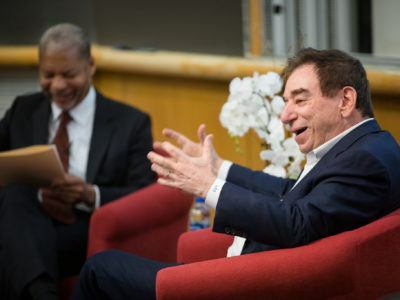 An alumnus of Delta Phi, Edinger joined Elaine Engst, MA ’72, university archivist emerita, in telling the story of Baldwin’s legacy and Cornell’s involvement in the two world wars. Elsewhere, Homecoming attendees looked to the future during a lecture titled “I Have Feelings, Too—How Can Robots Communicate an Emotional Response?” Guy Hoffman, the Mills Family Faculty Fellow and assistant professor of mechanical and aerospace engineering, and Rob Shepherd, assistant professor of mechanical and aerospace engineering, gave a demonstration and taught a class on new technology that may change the way we interact with robots. 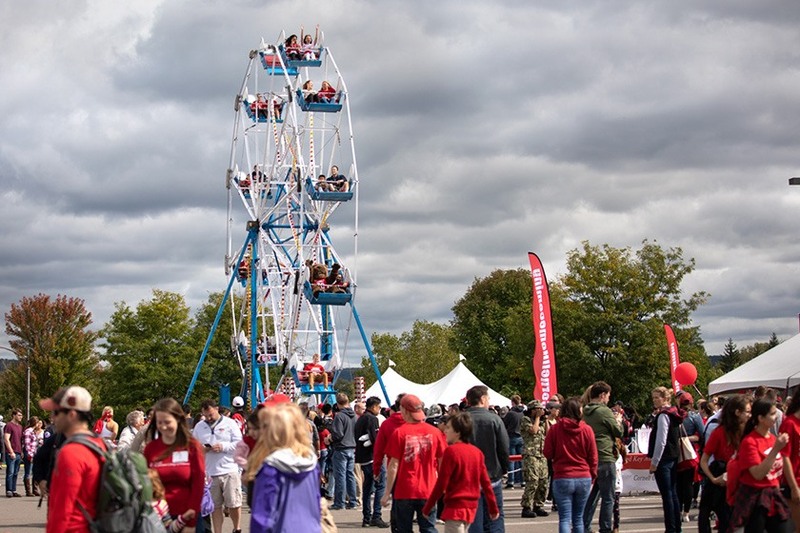 In the Crescent Lot, the Big Red Fan Festival showcased highlights of current Cornell teaching, research and student groups. 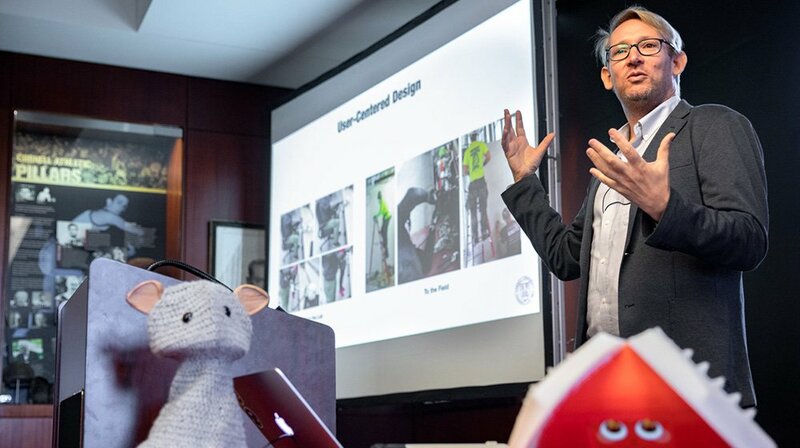 Representing the College of Agriculture and Life Sciences, Frank Rossi, PhD ’91, associate professor of horticulture, used a grass-trimming robot to draw attention to his team’s research on sustainable lawn care practices. Nearby, the Cornell Orchestras promoted their upcoming concerts while members played renditions of popular tunes. 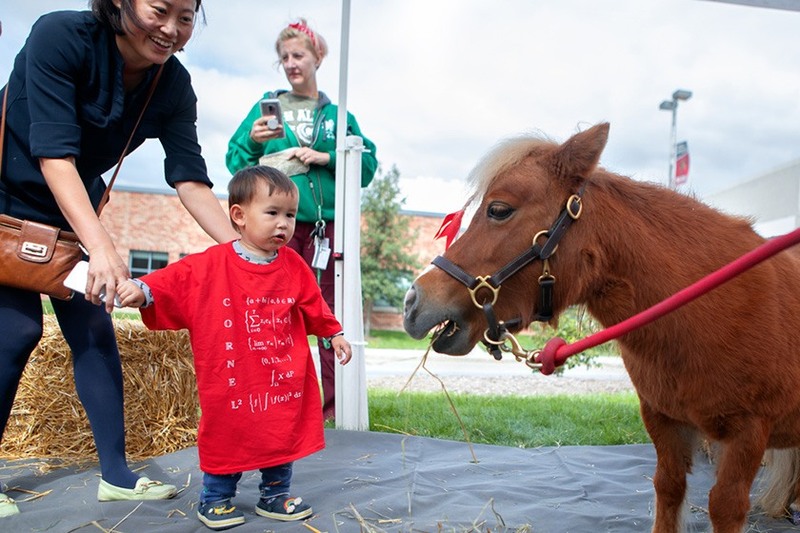 The College of Veterinary Medicine hosted a tent where humans could spend time with animals, including therapy dogs and Minnie the miniature horse. 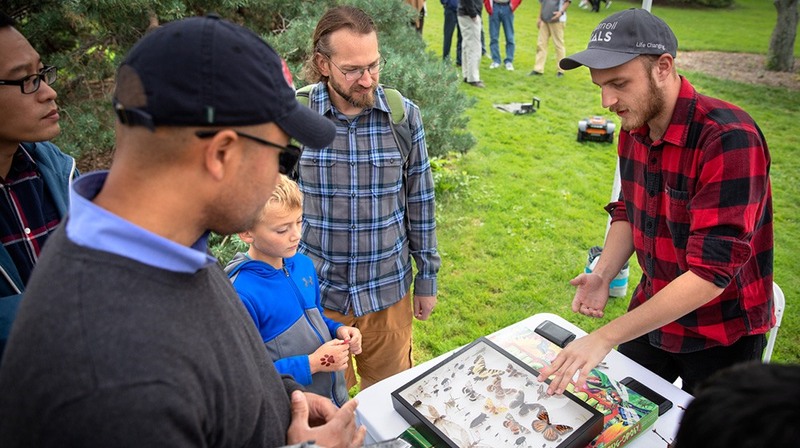 And Homecoming attendees of all ages learned about conservation efforts through interactive displays from the Elephant Listening Project, a program of the Cornell Lab of Ornithology. “Engaging kids is the most important thing we do,” said Ana Verahrami ’17, research assistant with the Bioacoustics Research Program at the Cornell Lab of Ornithology. Homecoming brought many families together. Renato and Maria Labadan traveled from Washington, DC, to visit their son, Nic Labadan ’22, and to enjoy all the Ithaca campus had to offer, including their own family tradition. Tailgate tents were hosted by Big Red Athletics, Alumni Affairs, Cornell Law School, the Cornell SC Johnson College of Business, the ILR School, Mosaic, the Sorority and Fraternity Council, the Tower Club giving society, and Young Alumni Programs. Alumni of the Big Red Marching Band got together for a tailgate before joining the current band to march through the Fan Festival. Many alumni brought their own tailgating fun, including classes of the 1970s and 1980s. A group of alumni from men’s soccer teams of the 1980s from all over North America used Homecoming as the setting for an informal reunion. They supported the Big Red men’s soccer team in the Friday game against Niagara University and played their own pickup soccer game on Saturday morning. Saturday evening, they held a dinner and “roast” in the Big Red Barn. “The stories are the best part of getting back together,” said soccer alumnus Brett Wood ’85. 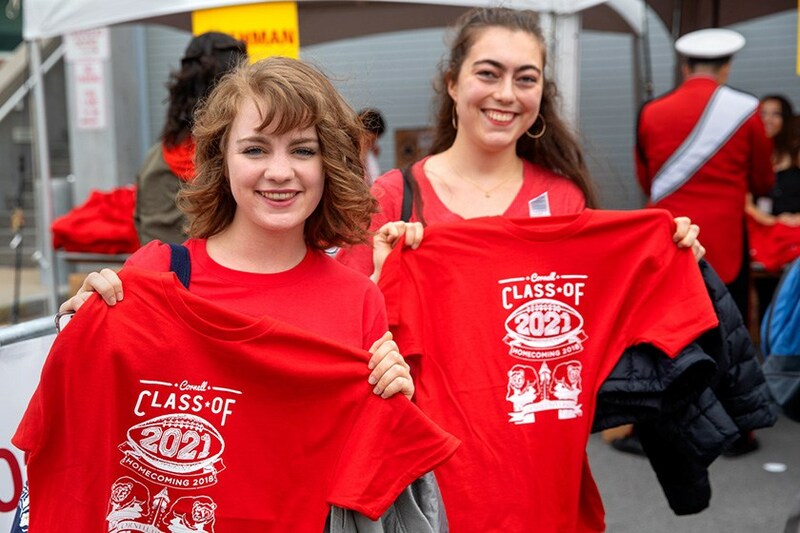 Current students came to Homecoming for the free offerings—including a T-shirt giveaway—and also for some well-deserved mid-semester fun. 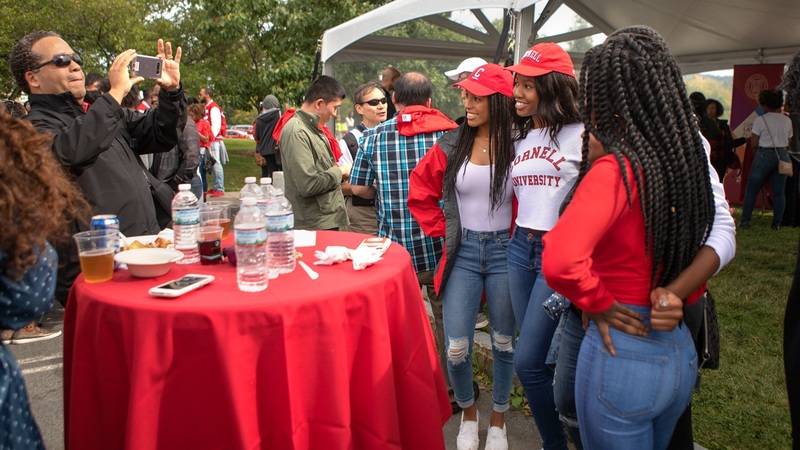 Standing in line to board the Ferris wheel, Jael Ferguson ’20 said she came to the Big Red Fan Festival to hang out with her friends and take a break from studying.